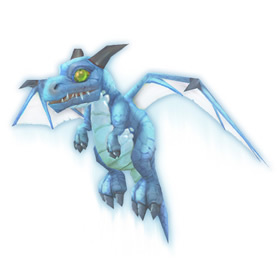 Collecting this pet is one of the requirements for the achievement Raiding with Leashes IV: Wrath of the Lick King, which rewards a quest to battle Algalon. Defeating him rewards Stardust! Hurls a bolt of mystical fire at the enemy, dealing 433 Magic damage. Slashes at the target with cruel talons, dealing 413 Magic damage. Increases your critical strike chance by 100% and reduces your accuracy by 25% for 1 rounds. A ward of powerful magic surrounds you, blocking the next attack. It's cute. Not very strong as a battle pet, however. Dropped on 25 Man Heroic tonight 2/22/2017 and it does drop off the dragon you heal. OMG this is almost as sad as the Frostwolf Ghostpup. "The little wolf told to stay. Watching, waiting, for vacant prey. Too proud to leave, she slipped away. Unburdened now, forever free to play." The Lich King tore the spirits of Sindragosa's lost whelps into undeath in front of her skeletal form as a final affront to the great dragon.